Perhaps he would have done the same if he had taken up creating scenes for the theater: do not playwrights derive improbable and clever events from passages of probable but insipid things, so that they may be satisfied with unexpected hircocervi of action? I must not omit to mention the time-honoured Hircocervus, or picture of the ‘trusty servant,’ which hangs near the kitchen, and which emblematically sets forth those virtues in domestics, of which we Americans know nothing. 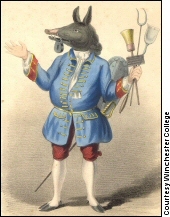 It is a figure, part man, part porker, part deer, and part donkey; with a padlock on his mouth, and various other symbols in his hands and about his person, the whole signifying a most valuable character. The views of the college menials on this characterisation are not recorded. Last modified: 28 April 2007.